Tarot readings for greater personal clarity and insight, with a written account of your Tarot story mailed to you. Inside a Tarot Reading: Seek & Ye Shall Find Yourself! The Seeker, Six of Wands & King of Cups from the Pagan Otherworld Tarot Deck by Uusi. In our monthly emails (sign up here), we send a message from a three-card Tarot reading conducted just for the occasion—a message for contemplation or guidance. My only question to the cards was this: What message does our community need to hear at this time? Remain open to cosmic grace, to magic. In doing so, find stronger connection within your community and discover more fully the nature of your own heart. To go a bit deeper, here’s a break-down card by card. This card was designed to function as a significator—a card you can pull from the deck and set down in a spread as a stand-in for the querent, the person coming to the cards for insight. Other cards that arise in any given reading will begin to form shapes and formations around the querent (or Seeker). I didn’t realize this fact when I first opened the deck. I thought, “Oh, they added the most incredible major arcana card in the history of the Universe!” and I shuffled The Seeker in with the rest. 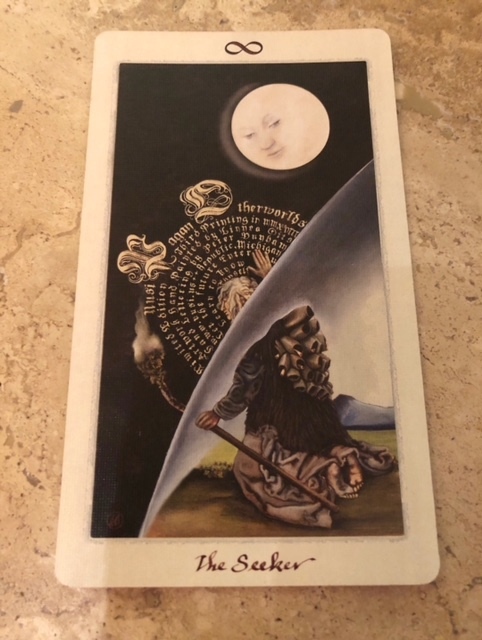 I viewed this card as a more intentional version of The Fool—a person actively seeking spiritual knowledge, whereas The Fool seeks knowledge more generally, even if his journey is ultimately spiritual. When I finally realized this card wasn’t intended as part of the major arcana, I thought, “Oh, makes sense,” but carried on just the same because I liked my mistake—and to each her own Tarot moves! In any case, here’s The Seeker, a bold opening overture, extending a spiritual invitation in striking terms. On his knees, the figure peers into the great unknown, wrapped in a spiral of wisdom and blessed by the illumination of the full moon. This card encourages our surrender to the spiritual; it invites us to step into mystery as a way of enriching our existence here on earth. The next two cards in the progression move us back to the earthly realm, showing us how this spiritual curiosity can pay off for us on the ground. This is a card of victory and accomplishment, of feeling noticed by friends and comrades for successful fulfillment of one’s efforts. When we embody the energy of The Seeker, our spiritual appetite automatically helps us connect more meaningfully with our community—we’re suddenly open as we weren’t before. Others will notice the shift within, the way we walk with greater self-possession and integration, the way we approach life with greater joy and vivacity, with appreciation for complexity, duality, and nuance. If the Six of Wands describes results in relation to others, the King of Cups describes evolution and growth that takes place within as the result of our spiritual quest. In this card, the king sits on his on rocky pedestal, gazing out to sea, holding his cup in contemplation, one hand almost fondling his heart space. He looks outward into another kind of abyss, but an earthly one, and yet holds himself with strength and fortitude, at peace with the man he’s become, content to marvel at the unknown. We know the cups represent the emotional realm, the zone of the heart, and the king is the master of this domain. He understands his own emotional landscape; he doesn’t fear his emotions or find them confusing, however they may shift or change. 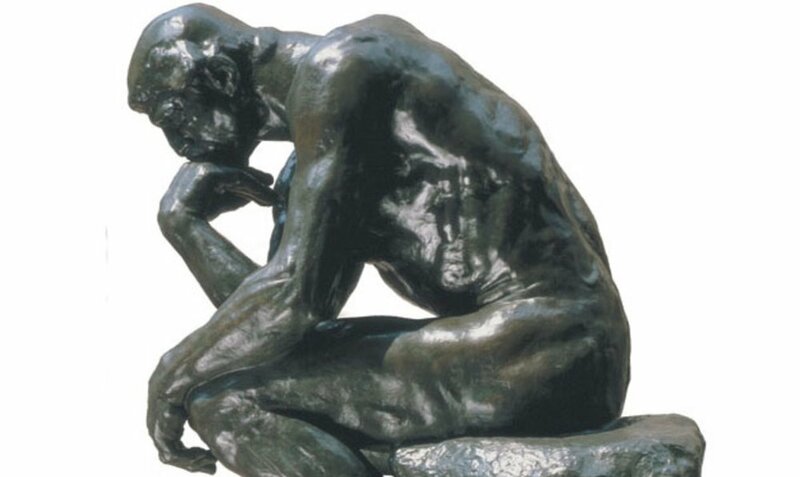 He reads his emotions as signals, opportunities for greater curiosity. He can use this emotional wisdom when he interacts with others—intuiting their emotional chemistry and calibrating his reactions to provide emotional support, but without overextending himself or taking on emotions that belong to others. This card describes the internal shift that awaits when we take up the path of The Seeker. We come to know ourselves more fully; we feel more at peace with the shifting waters of our lives, our psyches, our changing desires; and we come to know the nature of our own hearts. We can find stillness and reassurance in times of loneliness, chaos, conflict, and deprivation. In full possession of our hearts, we can connect easily and meaningfully with others—and ourselves—in ways that reverberate through and across lifetimes. We can see how the cards speak to one another individually, how they create a narrative. But one thing I’ve noticed about this deck and its fabulous design—the cards also communicate by aligning visual scenes across cards, using sight-lines, angles, and horizons that traverse the entire row. We can read these three cards together not only as chunks of a story, but sectors of a map, or pieces of a visual puzzle coming together. It helps that the horizon reaches seamlessly across all three cards. Like illustrations depicting man’s evolutio—each stop a milestone in a new phase of development and being. In our reading: the spiritual plane, the communal plane, and the individual plane. Notice how the first and third card create bookends that culminate in a literal shoreline (in King of Cups) and a metaphysical one in The Seeker. This is the island of the self. On one side, boundless cosmic real estate; on the other, the endless depths of the ocean. Notice how The Seeker is turned away from the scene. Before him, the infinite abyss of cosmic wisdom. Behind him, earth, solid ground, the place he knows and inhabits. When he returns from his journey—even if he’s merely glimpsing briefly into a higher realm—he returns to find the world as he remembers it. Imagine The Seeker pulling his head from of this bubble of insight, shaking his head with wonder, trying to gather his senses again. When he’s ready, he turns around, retracing his steps home. As he begins, he’s greeted by the six wands—recognition and accomplishment. He’s likely to stop at the party awhile and enjoy his new ability to relate and connect. He sees his friends as gentle souls, all trying to find their way through the swirling, orderly chaos of the cosmos. His sense of compassion is heightened; he is curious to know how his loved ones struggle and succeed in their own lives. He may not have concrete answers, but he feels greater emotional resonance within because he joined with spirit—all he ever was in the first place. He returned home briefly (to cosmic love and oneness), then returned home again (to groundedness and gravity and the pleasures and pains of life on Earth). As you continue practicing Tarot, connections of all kinds will gradually emerge for you intuitively. It’s like slowly and gradually learning a new language. You become more fluent with time, but the language will never completely give up its mystery.) Just continue looking, noticing, asking, receiving… seeking, seeking, seeking!